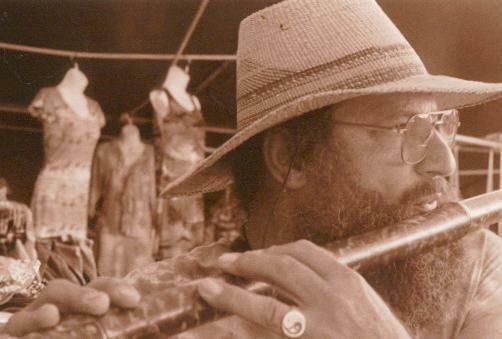 At the lower portion of this page you can click on the icon for a sound demonstration of the various keys of some of the flutes available. 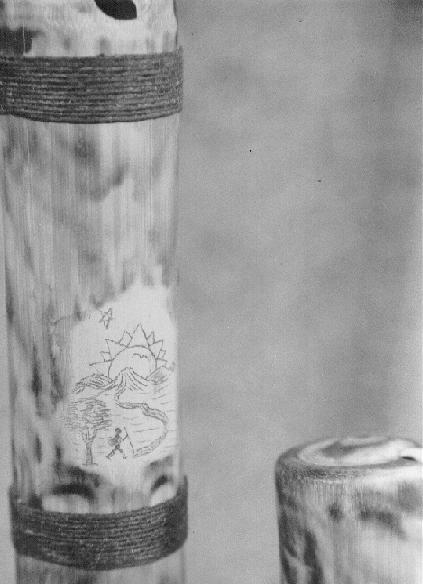 The scrimshaw picture on each flute is both my signature (the Morning Sun) at the top of the scene and a depiction of a parable, saying or symbol below. BAMBOO is our medium, however, bamboo is only bamboo! It is only a grass, not really a wood. It's only "one ply". Consequently, the moisture in your breath displaces the moisture between the fibers causing the flute to split after some time. This is not universal, but it does occure commonly. To overcome this, we treat (read "burn") the flute with flame from a torch thus steaming most of the moisture from the fibers and partially cauterising them so they don't rehydrate well and therefore the flute doesn't change much. If it doesn't try to change, it is not going to split and the end result is an instrument that will probably last for 50 years or more. (I have one made for me by my Flute Master Joe Kasik that is 28 years old and is still in great shape because of this method of finishing). Since I must use the flame from a propane torch to treat the flute, I also use the flame to produce beautiful and varied cloud-like patterns on the surface. After the heat treating, the surface is sanded by hand beginning with very course sand paper and graduating up to the very fine finish of jewellers rouge on a buffing wheel. Then a final coating of carnuba floor wax is applied providing a permanent water resistant beautiful protective shine. After a light vegetable oil coating in the boar and a tight wrap of Nyltex (beeswaxed nylon chord) at several key points the flute is done and should give years of pleasure with virtually no upkeep. 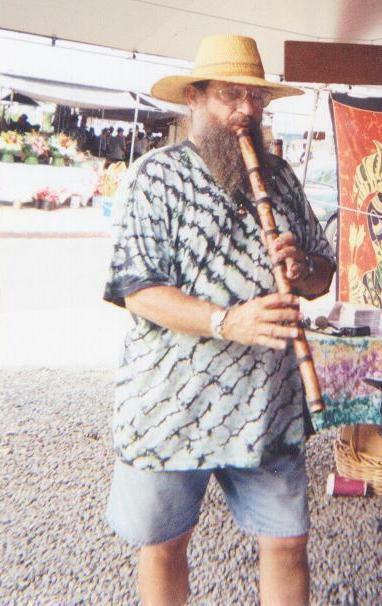 Traditional side-blown or "transverse" (celtic) style flutes are also offered in the diatonic (major) scale in the keys of A, G, F, E, and Eb. Flutes are tuned to concert pitch (A=440) in both octives. 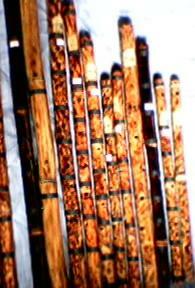 Playing end-blown flutes enables you to reach the finger holes on very long pieces of bamboo, (making very deep, low, beautiful sounds for the bottom or tonic note). The one shown here is in the key of A.